What must you consider when selecting software to automate your Budget Book? When evaluating budget book software, it’s easy to get lost in a list of features or flashy marketing. But which features do you really need? You know that you need to pick a reliable vendor, but what does that mean? It is imperative that you select a software offering features that fit the needs of your organization today and one that easily scales as your needs evolve, but what are those key features? 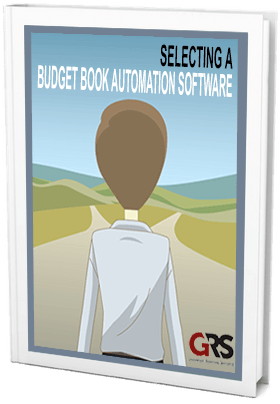 Simply complete the form and we’ll send you the eBook, Selecting a Budget Book Automation Software. What are the key features for importing budget & performance measure data? Tools to ensure agreement and balancing across the entire budget book. How can you be sure that the vendor has the appropriate knowledge & track record? Tools to add & modify statements, schedules, & footnotes. Features designed to generate a complete, professional product. What skills should the team implementing your solution have to increase likelihood of success?